The North Florida Ospreys travel to Crisler Center to play the Michigan Wolverines on Saturday, November 11, 2017. North Florida heads into this matchup after finishing last year with a mark of 13-18. They had a point differential of -1.1 as they averaged 77.6 points per contest while giving up 78.6 per game. Michigan had an overall record of 20-11 last season. They averaged 74.8 points per game and surrendered 65.5, good for a point differential of 9.3. Dallas Moore averaged 23.9 points per game while playing 35.1 minutes per night last season. He pulled down 3.1 rebounds per game and dished out 4 assists per game as well. His field goal percentage was 44% while his free throw percentage finished at 83%. Chris Davenport averaged 10.9 points per game in 26.9 minutes per contest last season. He averaged 3.5 assists per contest and 6.6 rebounds per game. His field goal percentage was 50% for the year while his free throw percentage was 73%. Derrick Walton averaged 15.5 points per game while playing 34.8 minutes per contest last year. He grabbed 4.8 rebounds per game and had 5 assists per contest on the year. His field goal percentage was 44% and his free throw percentage was at 88%. Zak Irvin averaged 13 points per game last season and he saw the court an average of 35.4 minutes per contest. He also averaged 4.5 rebounds per contest and 3 assists per game. His field goal percentage was 45% and his free throw percentage was 67%. North Florida averaged 77.6 points per contest last season, which ranked them 76th in the nation. Their average scoring margin was -1.1 and their shooting percentage was 46% as a team, which had them ranked 103rd. Behind the arc they shot 35% which was good for 172nd in the country. They averaged 38.9 rebounds per game and 13.1 assists per game, which ranked them 38th and 203rd in those offensive categories. In the turnover department they ranked 10th with 15.9 per game. The Ospreys allowed 78.6 points per game to their opponents which ranked them 311th in Division 1. They also allowed a 45% shooting percentage and a 36% average from behind the arc, ranking them 228th and 234th in those defensive categories. Opponents averaged 36.0 rebounds a game which ranked 220th and they gave up 15.0 assists per contest, which put them in 305th place in college basketball. They forced 12.0 turnovers per game which ranked them 81st in the nation. Michigan was 137th in the country with 74.8 points per game last year. They were 19th in D-1 in shooting at 48%, while their average scoring margin was 9.3. They shot 38% from 3-point range, which was good for 51st in college basketball. They were 346th in the nation in rebounding with 29.4 boards per game, and 153rd in assists per contest with 13.7. The Wolverines were 351st in turnovers per game with 9.5. 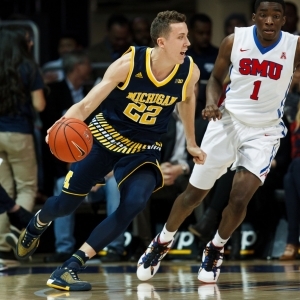 The Wolverines surrendered 65.5 points per contest, which ranked them 38th in the country. Their defense allowed a 46% shooting percentage and a 38% average from 3-point range, ranking them 298th and 313th in those defensive statistics. They ranked 41st with 11.3 assists allowed per contest and 22nd with 31.3 rebounds surrendered per game. The Wolverines were 155th in Division 1 in forcing turnovers with 12.9 per game last season. The Ospreys were 142nd in the nation last year in offensive rating with 105.8, and their defensive rating of 107.3 was ranked 279th. In terms of pace they were 35th in the country with 73.3 possessions per 40 minutes, and their effective field goal percentage of 53% was 83rd. As a team they were 116th in college basketball in true shooting percentage with 55% and they shot 3-pointers on 42% of their shots, ranking 56th in Division 1. North Florida was 26th in turnovers, as they turned the ball over an average of 18.7 times per 100 possessions while forcing 14.2 on the defensive end. Their defensive effective field goal percentage for the season was 51%, which was 206th in the nation. Michigan was 344th in college basketball in turnovers, as they turned the ball over an average of 13.3 times per 100 possessions while forcing 17.7 on the defensive end. Their defensive effective field goal percentage for the season was 52%, which was 243rd in the nation. The Wolverines were 10th in the country in offensive rating with 116.3, and their defensive rating of 101.9 was ranked 161st. In terms of pace they were 346th in Division 1 with 63.7 possessions per 40 minutes, and their effective field goal percentage of 57% was 10th. As a team they were 9th in D-1 in true shooting percentage with 60% and they shot 3-pointers on 45% of their shots, ranking 18th in the nation. Who will win tonight's North Florida/Michigan college basketball game against the spread?